Why bother up-grading to LED High Bay lights in your warehouse, retail or open space? The electricity savings are enough to payback the capital cost well under 2 years, depending on your electricity rate. Add our Motion and Daylight Sensors for use in areas occupied intermittently or in bright day light locations- and save around another 20%. – with better light quality. 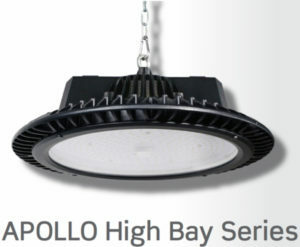 That’s a Return on Investment of well over 50%……..
Our LED High bays use Phillips chips and U.S made Mean Well drivers. They have a 5 year Warranty—and will last well over 10 years before they need attention. Sorry, we only do quality, not cheap. LED lighting is the closest thing to daylight. Metal halide lights use about 460 Watts, Our Apollo High Bay lights produce over 150 lumens per watt – they are a market leading light. Expect to put clear, clean light onto inventory, floors and work surfaces. 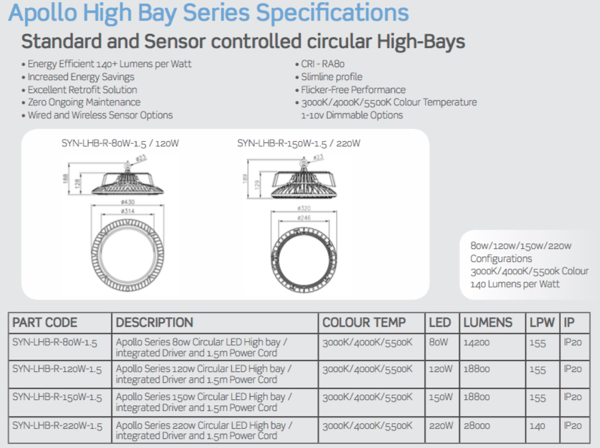 We can supply a range of styles, components and light outputs. Tell us what you need. Every Metal Halide High Bay you changeover to an LED Hi-bay removes a TON of carbon from the electricity grid each year. That’s the same amount of carbon from planting a tree in a forest. You also eliminate Mercury from your lights, making for a safe environment.